I have been doing a lot of recipe testing lately.....no, not for a book, for someone else and as such, I have had to deal with lots of leftovers. When I opened the fridge yesterday for lunch, a bowl of sausage meat stuffing containing apricots and other matter was staring me straight in the face; wiggling a suggestive finger, saying why don't you finish me off big boy. So I whipped the contents into a frying pan and shaped it into a patty and whilst it bubbled and sizzled away I started thinking about what else could I cook with it. As there was also some braised red cabbage left, full of woe and sorrow and some streaky bacon just starting to go on the wane, I started to concoct a plan. Which involved buttering some brown bread and making a majestic sandwich. If you were in any doubt that sandwiches were majestic then you should check out this book. Anyway, the kitchen suddenly became a hive of activity with smells and sounds that drove the ol' saliva glands into overdrive. 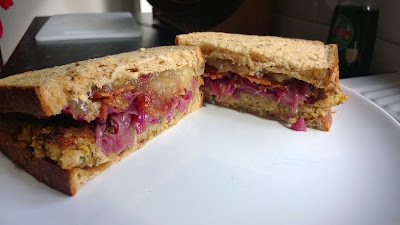 The sausage patty, Fort-uitously moist yet crisp was set down first, followed by the spiced cabbage, scalding hot following a two minute ping and then came the bacon, gloriously resurrected and stiff as cardboard. I did begin to falter after that point though and began to dig around for something that would finish the sandwich off, to make it complete. Mustard? Mayo? Salad Cream? Non! None of these would do. Then I spotted a jar of apple sauce, languishing next to last year's runner bean pickle. That would do the job. And it did. Some people don't like to align themselves with the aggregate church of salt, sweet and savory and this sanger certain ticks those boxes so it might not be for everybody. You might even be staring at the picture right now, thinking "What the fudge?" I don't care. I know I definitely plan to make this on Boxing Day. I might even stick some turkey in next time around too. Sounds like a perfectly balanced sandwich to me. Excellent work, POWER BALD! Hahahahhahaha I still can't stop laughing about that.